Review: In the vastly over-saturated zombie-horror genre, it’s safe to say that it’s extremely difficult for new titles to make much of an impact. 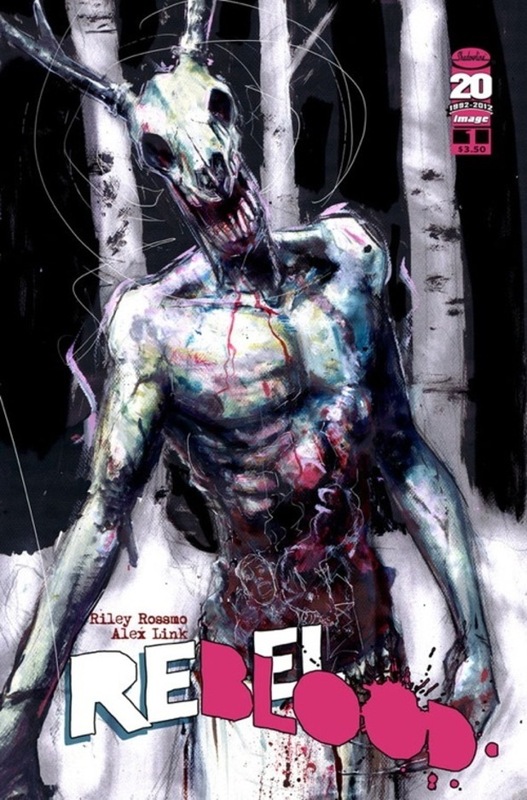 However, Rebel Blood – a four-part Image-Shadowline Comics mini-series from Riley Rossmo and Alex Link – is a book that instantly grabs and holds your attention through a combination of its creative narrative approach and the disturbing imagery utilised throughout. Our main character, fireman Chuck Neville, is a man whose professional and private life are both in ruins. His marriage is in tatters and, following a work-related accident, he finds himself given the dead-end demotion of manning an isolated fire tower in the middle of the wilderness. A ‘land-locked lighthouse’, as he beautifully describes it. Somewhat daringly, the issue starts completely dialogue-free for the first several pages, forcing us to watch as Chuck is thrust right into the heart of the insanity that is to be the theme of this series. Chuck finds himself in a waking nightmare. As the story continues, the non-linear narrative style that Rossmo and Link have opted to use may be a little disorientating at first, but quickly settles into a steady flow that doesn’t require much in the way of hand-holding. Also, in an inspired piece of storytelling, we are periodically given brief glimpses into Chuck’s imagination as he tries to predict how his actions will play out. These scenes give us a tremendous insight into the man’s already fractured mind as he struggles to deal with the ordeal that surrounds him. 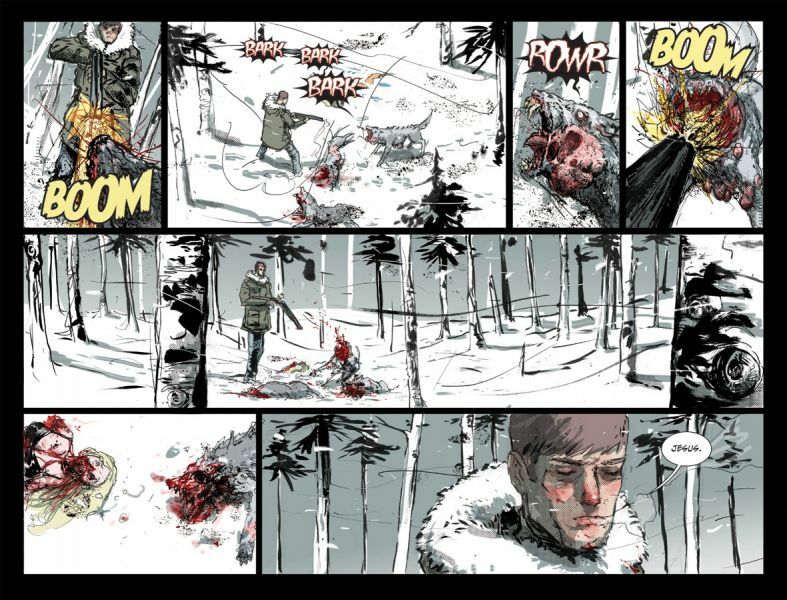 All the way throughout the comic, Rossmo is clearly having a blast as he gleefully illustrates all manner of mutated, deformed and blood-soaked wildlife and humans. His scratchy, sketchy but always extremely well-controlled artistic style gives everything a tremendous sense of energy, and this is never more apparent than in the frenzied (and seemingly relentless) series of attacks thrown Chuck’s way. His subtle changing of colour palettes also serves as a ‘guide’ of sorts to navigate the shifts between past, present and Chuck’s own inner thoughts. This isn’t a series that slows down to allow much in the way of exposition, and as the story whips along at a breakneck pace, it’s easy to get the impression that we’re just along for the ride, watching the events unfold with the same helplessness that Chuck himself feels. Small details are drip-fed to us, but never enough to really explain the bigger picture, and in many ways that makes the whole thing even more horrific. Now, as regards the ‘zombie’ aspect of the story, the humans Chuck encounters aren’t so much zombies in the traditional sense, but rather infected, mutated disease-carrying maniacs. A subtle distinction, sure, but one that I think needs to be mentioned to avoid this title being instantly pigeon-holed as ‘just another zombie series’. These aren’t shuffling, brainless meat-sacks. Far from it in fact, and as the series continues, this becomes more and more apparent. 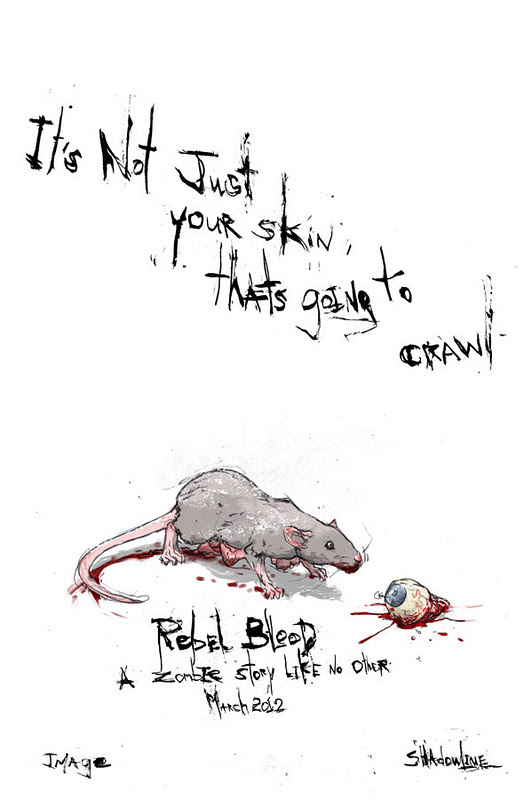 However, the real highlight – if you can call it that – of the series is the infected wildlife, brought to life in a chilling, disturbing manner by Rossmo’s distinctive artistic style. We see rats, wolves, owls, deer and rabbits (yeah, rabbits, and don’t mock until you’ve seen just how horrific these little fluffy buggers can be) all deformed, bleeding and hungry for blood. Another subtle departure from the usual generic ‘zombie’ formula, and again, one that only serves to increase the horror of the situation, in my opinion at least. This is a skillfully put together series that thrives in using its disturbing subject matter and imagery to add a further dimension to the story, and which seemingly revels in watching the psyche of its main protagonist slowly unravel almost page by page. It’s not a conventional comic in any sense of the word, but it is an extremely compelling one, and one you’ll find yourself going back to time and time again. And, without including any spoilers, the surprising revelation in the closing pages immediately warrants another read-through of the story with a fresh perspective on the events. Simply put, this is an extremely interesting and creative take on what has become a bit of an overloaded genre, and manages to raise its head above the rest of the pack with the combination of its unique approach to storytelling and the utterly inspired artwork for which Rossmo is famous. If you fancy something a little different, featuring some haunting imagery that will stay with you for a long, long time, you could do a hell of a lot worse than giving this a look. If nothing else, you’ll never look at rabbits the same way again.